During the last trimester of my pregnancy, both the prospect of my baby’s disability and the prospect of his death frightened me. From the time I was seven months pregnant, I knew he wasn’t expected to live long. I wasn’t sure I was up to being his mother. I wasn’t sure I could handle the pain. I wasn’t sure I could love him enough and then let him go. The ultrasound technician picked up anomalies during the second trimester in a routine exam, pressing the wand against my slippery, swollen belly over and over to get a detailed look at his abnormal kidneys. Kidney defects are quite common and treatable, so we hoped for the best. But additional abnormalities showed up as my pregnancy progressed. Subsequent scans showed six toes on each foot and an extra flap of a digit on each hand. An amniocentesis early in my seventh month provided the damning diagnosis. I took the call from Rebecca, the hospital’s genetic counselor, around 6 p.m. on Friday, June 18, my fifth wedding anniversary. I sobbed as Rebecca told me she’d leave a packet of information for us outside her office door. My husband, Mark, canceled our celebratory dinner reservations and picked up the manila envelope instead. Shocked, I sat down beside him on the couch and we flipped through the brochures together, beginning to realize the hopelessness of our son’s condition even as we felt his kicks through my cotton, floral maternity dress. I went to my baby shower the next day, and I made the hard decision to keep the news and my feelings to myself a little longer. I wasn’t yet ready to reveal this shift in our world. I choked back tears and smiled wanly as I opened pale blue terrycloth onesies and the stackable blocks I knew my son would never use. We met with Rebecca the following week, and she reiterated what we had learned from the pamphlets — that Trisomy 13 is a random genetic mutation that occurs only once in 5,000 newborns. Many Trisomy 13 fetuses are miscarried. Most infants born with the syndrome die within the first three months of life. Hearing Rebecca confirm these grim details felt like a body blow to my gut. I was seven-and-a-half months along now and completely lost my appetite. I had to force myself to continue eating healthy foods. I bitterly thought, So much for skipping coffee during my pregnancy. A lot of good that did. The impact of caffeine on my baby’s deformed body seemed absurd, but I kept up my nutritional discipline anyhow. Rebecca had informed us that if we wanted to investigate ending the pregnancy, we could take our case to the hospital ethics board. My husband and I were glad this option was available, but decided we would prefer to let nature take its course. We didn’t want the potential burden of guilt from the choice of such a late-term abortion in addition to our already palpable grief and my growing fear. I worried that the baby would die inside me, and was reassured each time I felt him kick. Even worse, I worried that I wouldn’t know how to care for a disabled baby, that I wouldn’t be able to love a disabled baby enough. I dealt with my fear by speaking with other mothers. A woman with whom I’d worked had carried a severely disabled baby to term only to see him stillborn. When I phoned her for advice on my situation, she told me, “Be prepared that your baby may not look like a normal baby.” She also gave me a reference for the local funeral home she had used that provided free cremations for infants. 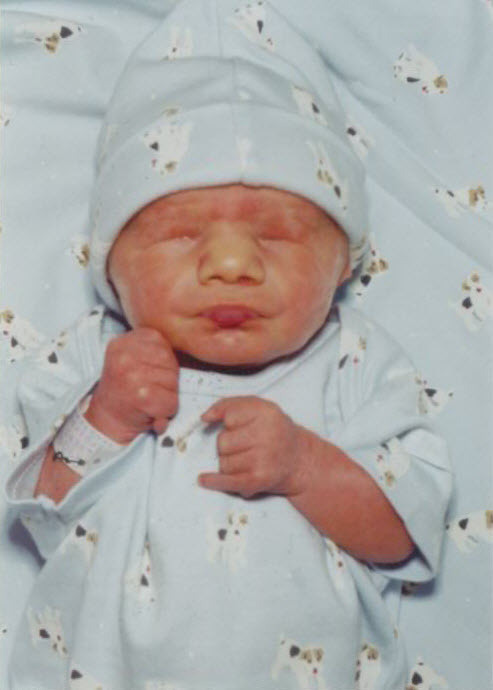 I spoke to the mother of a Trisomy 13 child in Eastern Washington whose son was still kept alive by a feeding tube. She told me that despite the hardships in the years since he’d been born, her son was the light of her life. She offered to stop by for a visit in the coming weeks so I could meet her son. Now eight months pregnant, I declined — I was afraid of how I’d react when I met her son. I thought I would break down crying upon meeting him and seeing the severity of his disability and felt ashamed that I might not be able to welcome her son as she so joyfully and admirably had. A few days passed, and then my water suddenly broke as I stood up to leave work one afternoon, three-and-a-half weeks before my due date. I stopped in the office restroom to be sure, then drove myself home. My heart beat quickly as I threw a nightie and some preemie baby clothes into an overnight bag and called Mark. “We have to miss our labor class tonight,” I said. On the drive to the hospital, I felt relieved that my son had beat the odds so far — he had survived the pregnancy, and I hadn’t had to face him dying inside of me. I began to feel excited to meet this little fighter who apparently wanted life so badly. I also still felt scared. And was still not sure if I could love him if he didn’t look “normal,” and not sure I had the courage to be the mother he needed. I labored for hours (painlessly, thanks to the epidural), and as my baby’s head was crowning, my ob/gyn said, “I’m sorry — it doesn’t look good — I don’t think he made it.” I sobbed as I continued to push. My son was born. I heard his strong cry, and I began to cry for joy myself. The doctor apologized — our son’s scalp wasn’t fully closed and had an open wound on it, and she had assumed as his head was crowning that he was dead. We named him Max James. He had no sucking reflex and had difficulty swallowing; it was as if his body was telling him he wasn’t meant to last on this earth. His eyes never opened. He had extra digits on his feet and hands, and numerous other physical and mental defects we couldn’t see. But I was relieved to find him beautiful and felt a rush of love for him, smoothing the wisps of fine hair behind his ears as I held him. He was tough, all right — he squirmed and stuck his chin out, his legs kicking, his fingers clenched into fists. He was unable to breastfeed, so a nurse showed my husband how to finger-feed him, dropping little drips of pumped breast milk from a tube attached to his finger into Max’s mouth. When we got ready to take him home the next day, one of the nurses leaned in the backseat of the car where I was strapping five-and-a-half-pound Max into the car seat and said, “Now, you enjoy every minute with him, won’t you?” Tears pricked my eyes, and I swallowed a lump in my throat, realizing again that Max’s time with us might be short. My original fear of not being able to love Max turned almost immediately into a fear of him dying. I was conflicted: I didn’t want him to die, but I also didn’t want him to live a life of such limited quality. I was afraid I wouldn’t be able to handle the grief, that I wasn’t up to the task. At home, we held Max constantly. He even slept between Mark and me in our king-sized bed. As we were drifting off to sleep our first night home, Max’s breathing became congested and raspy. We could hear fluid in his lungs. Mark rushed Max into the bathroom and clapped him on the back until gobs of green mucus landed in the white basin. Over the next couple of days, we had a routine follow-up visit with a nurse, who was alarmed that Max was extremely jaundiced and had dropped nearly a pound of weight. She instructed us to force-feed Max formula with a bottle and sent a nurse to our home to set Max up with a bili light blanket to help treat the jaundice. Max aspirated formula while the nurse was in our home, and before we knew it, she had resuscitated him and called 9-1-1. Back in the hospital, the ER doctors told us they couldn’t get all the fluid out of his lungs and that Max’s time was limited. We took him home, where our extended family met us and took turns holding Max, then left Mark and me for the evening. Mark put Kind of Blue, his favorite Miles Davis album, on the stereo, wanting Max to hear beautiful music. While it was still warm out, Mark carried Max outside so he could feel a soft summer breeze on his cheeks. Mark held Max, resting our infant’s bare chest against his. Max seemed to calm at the feel of skin against skin. As the evening darkened, Max’s breathing grew more labored. I changed him into our favorite outfit, sat with him in my arms on the couch, and sang “Silent Night” to him. It grew close to 11 p.m. and I could feel his time with us was nearing an end. I felt scared to see him die and even more scared to feel him die. I didn’t want to be the one holding him when he died. I didn’t want to feel his body stop moving, feel his warmth cool, hear the silence when he stopped breathing, see his stillness. I handed Max to Mark to hold next to me and continued to touch him and hum to him. A few minutes later, Max lifted his arms to us in what we would later learn was a physical reflex, but felt to us like a desire for one last hug. He drew his last breath and died. Mark and I both cried for an hour or more. We wrapped Max in his fleecy pastel baby blanket and laid him for the first time in his crib in his bedroom. It was the only night he would spend in his room. I went to bed and cried all night, imagining terrible scenes, like flies landing on my baby’s corpse in the next room. When the funeral home came to pick up my baby the next day, I snipped a lock of his hair to keep before I let them take him. When I finally returned to work after my maternity leave with only pictures to show my coworkers, I placed a framed photo of Max on my desk. It was a close-up of his serene face soon after he’d been born, his eyes eternally closed, a baby cap covering the open wound on his head. You could see the fuzz of downy hair on his rounded cheek. I found that I drew strength when I looked at his picture. I aspired each day to be more like Max — to be bolder in my embrace of life, to be more fearless, to be more accepting of the harsh realities of life. If my four-and-a-half-day-old infant could meet his demise and go so fearlessly into the night, surely I could do the same someday. I wasn’t as brave yet as I aspired to be. I hadn’t been brave enough to hold my baby while he died, and I felt ashamed of that. But I was braver than I thought. I’d been brave enough to love him. I’d been brave enough to let him go. Wendy Staley Colbert’s personal essays have been featured in Salon, Whole Life Times, Off Our Chests, and other publications. She is working on a memoir about her relationship with her brother who suffered from schizophrenia.